The holidays are coming! Seriously, they're right around the corner, creeping up on us with every passing moment. Family gatherings. Dinner with friends. Holiday parties. Are you ready? If you're not sure what present to give, why not take the leap to a handmade holiday season this year? I use essential oils year round. I mix & match oils in my mini diffuser. I add a few drops of essential oil to coconut oil & apply it to my legs for moisture & shine. From home fragrance to body care, Nature's Truth Essential Oils* can be incorporated in many creative DIY projects. If you're looking for a simple but special do-it-yourself gift to give friends & family this holiday season, you're in luck. Makes 2 heaping cups of body scrub. 1. Combine sugars in a bowl. 2. Slowly mix in the coconut oil. 3. Add Nature's Truth Cinnamon Essential Oil. 4. Mix together & scoop the scrub into your sealable container(s). 5. To use: massage a generous amount of scrub to wet skin & rinse off in the tub or shower. I love to use this scrub in the shower because the spicy scent mixes with the soothing steam to energize the senses. The cinnamon smell is uplifting & reminiscent of holiday baking, while the exfoliating sugars invigorate your skin. This Cinnamon Sugar Body Scrub is a simple DIY project that anyone will love. I even coaxed my boyfriend to try it out! Use any essential oils your heart desires such as 4 Thrive, Wintergreen, or Peppermint (one of my faves). Feel free to experiment! I used cinnamon since it's one of my favorite scents. I conveniently bought my Nature's Truth Essential Oils from Target.com in my pajamas without ever having to leave the house, but you can normally find them in the vitamin aisle. It took everything in my power not to purchase multiple items I don't need. 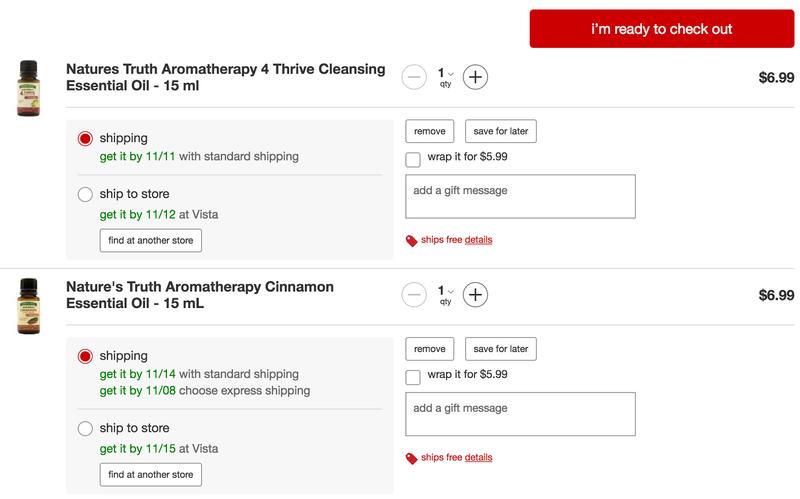 Target always does that to me, but I was strong this time & only bought essential oils (to add to my growing collection). I'm a genuine essential oil lover & I sincerely hope you try this simple DIY Cinnamon Sugar Body Scrub Recipe. You can use Nature's Truth Essential Oils in body scrubs, massage oils, air fresheners, soaps, the list goes on. Here's wishing you happy holidays & happy DIYing! P.S. get a $1 off from Nature's Truth. I love the scent of cinnamon (& the taste obviously). This sounds like the perfect holiday treat for my skin. I´ll so definitely make this at home. Maybe I´ll even make a pot extra for my sister as a tiny pre-Christmas gift. Cinnamon is always good for he body and I can't wait to try making a scrub using this recipe. Thanks for sharing Carmen. This is such a nice idea. Thanks for sharing. I've already made cinnamon body scrub and I loved it! Great DIY! I love the smell of cinnamon so that's perfect for me! Nice post dear, thank ypu for sharing. Cinnamon and sugar are a great combo together, I'm sure it will do wonders. This is such a great idea! It would make for a great gift! I've never really used body scrubs before but you had me at "cinnamon" - the smell is enough to make me want to try it and I definitely think it'd make a great gift. Ooooh, this sounds like a perfect Autumn scrub! I've got to try this out! I will absolutely try this! Thank you for the receip! I would love some of that right about now! Looks great! Body shrubs are lovely... will always recommend any for anyone. Combining cinnamon and sugar am sure will be a great combo. DON'T MISS: EASY STYLE WITH JEANS AND BELL SLEEVES JUMPER!